Adding this mayonnaise made with aquafaba (chickpea brine) is a perfect way to dress up a delicious piece of leftover or canned salmon. 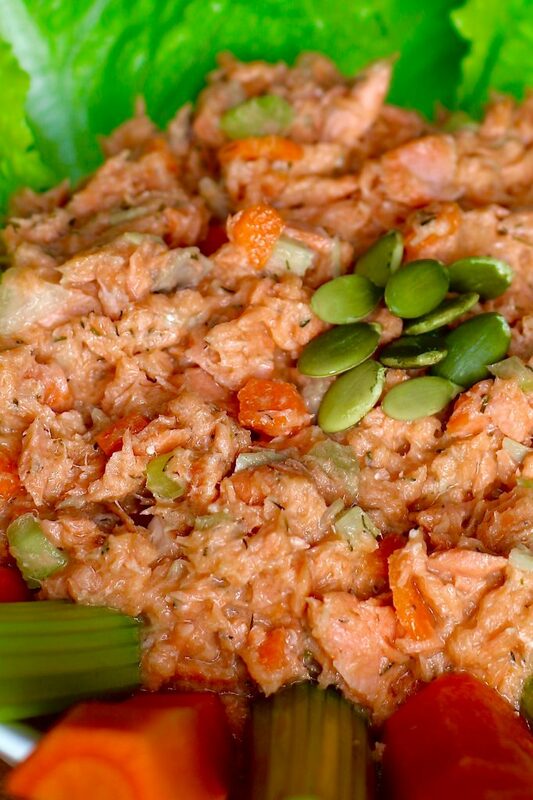 This recipe is loaded with only healthy ingredients, but without compromising the taste of what you would expect from a salmon salad. 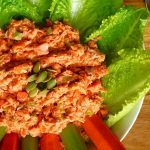 It is EGG FREE, DAIRY FREE, GLUTEN-FREE, KID-FRIENDLY and also makes a perfect SUPER BOWL APPETIZER! Feeding a family of six is not easy especially when four of them happen to be growing males. Sometimes I question whether I am raising boys or pandas. Did you know these cuddly bears can ingest 20 to 40 pounds per day?! My boys do not eat nearly that much but it certainly feels like they do. Where it all goes is beyond me! Occasionally, I go a bit overboard when I am at the supermarket. How can I pass up a great sale on wild-caught salmon? There I was with a heaping mound of this anadromous aquatic animal… enough to feed a large group of ravenous pescatarians. Unfortunately, my children are not big fans of fish so finding the right blend of ingredients to entice them was mandatory. I recently discovered an incredible use for chickpea brine (the liquid from cooked garbanzo beans that is usually discarded) and decided to make a healthy egg-free mayonnaise that my older son could enjoy with his meal. Since he has been off of gluten, soy, egg, peanuts, dairy, and dyes for the past 6 years, he has inspired me to expand on my culinary development. I have enjoyed adding a multitude of inventive yet nutritious substitutions when creating a meal. 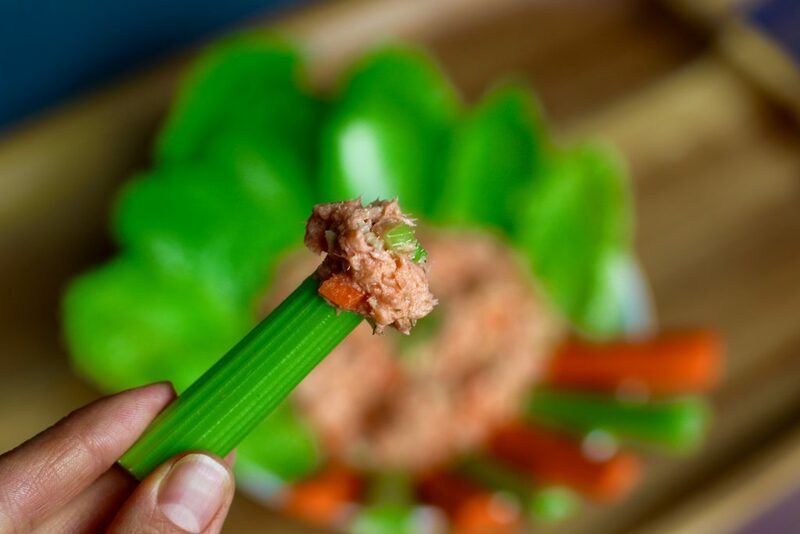 So my latest salmon salad recipe not only works well over lettuce or a gluten-free wrap, it also can be a tasty and nutritious dip. Perfect timing for this years Super Bowl party! What to do with your leftover salmon? Add a bit of my healthy mayonnaise made with aquafaba (chickpea brine) and you will not only satisfy your taste buds, you will also be fueling up your body with protein, omega-3 fatty acids, and a whole array of vitamins and nutrients. You can eat it on salad, in a gluten-free wrap, or serve it as a dip for this year’s SUPER BOWL PARTY. In a large bowl gently toss all the ingredients. 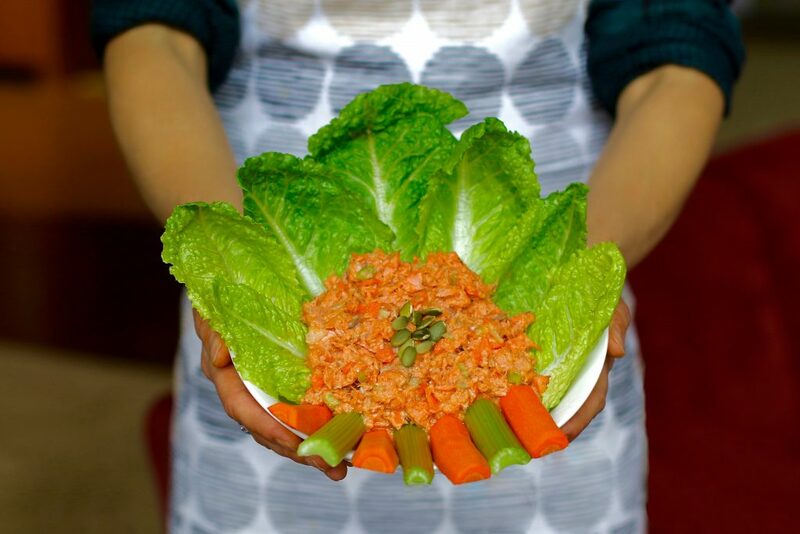 Serve as a dip or on a bed of lettuce or spinach, a G/F wrap or sandwich. Enjoy! 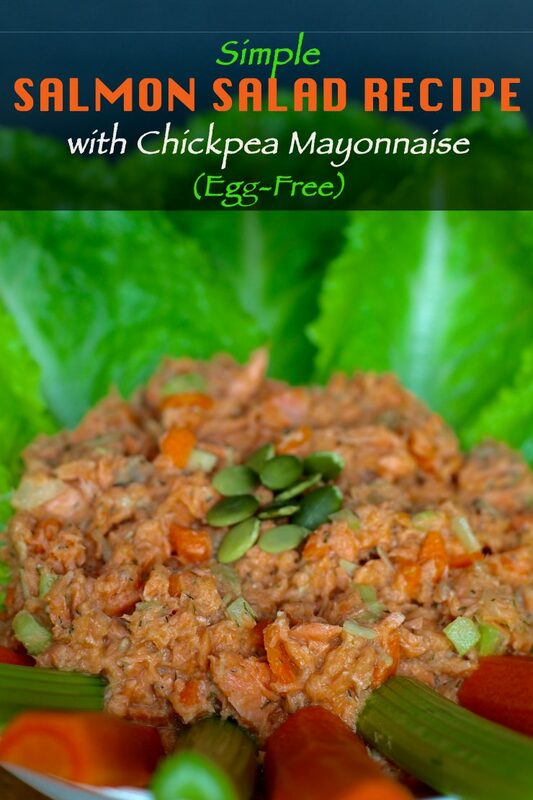 Try my Simple Vegan Mayonnaise made with Chickpeas. 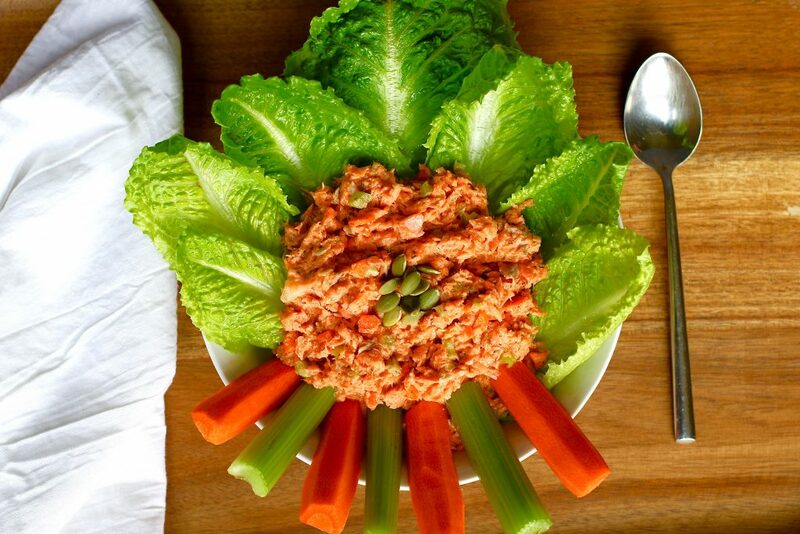 Do you like salmon salad?